Krupa Ge, is a writer and journalist. She lives in Madras. She is the founder/editor of the online literary journal – The Madras Mag. (www.madrasmag.in). She was shortlisted for a Toto Prize in Creative Writing in 2016. She was also a finalist in the César Egido Serrano Foundation, Madrid’s Flash Fiction Competition Prize, 2011. She studied B.Sc Electronic Media at MOP Vaishnav College and has a gold medal in MA Sociology from the University of Madras. She pursued a creative writing course at Anita’s Attic, under the mentorship of author Anita Nair. She has worked in leading national newspapers and written extensively on art, culture, music, literature, etc, over the last eight years. 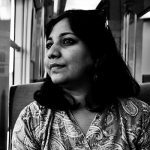 Her short fiction has appeared in Indian Literature published by Sahitya Akademi, Scroll.in, The Bombay Review, Muse India, 2014 New Asian Writing Short Story Anthology, Reading Hour and Papercuts among various print and online journals in India and abroad.